One day after US equity futures plunged in early morning trading on a combination of fears about China slowing, Italy's standoff with the EU, corporate profits, Fed tightening, escalating trade war and Saudi tensions, sentiment this morning appears somewhat more stable, even if S&P futures are near session lows and set for their 6th of losses, having faded an earlier bounce after Chinese stocks posted modest gains. The global picture was mixed, with Asian shares extending their decline on Wednesday, as the MSCI Asia Pac index (MXAP) dropped another 0.3%, and is now down 19.6% from its January high, just shy of a bear market despite a modest rebound in the Shanghai Composite as nervous investors were unwilling to buy the dip after the latest bout of market volatility. 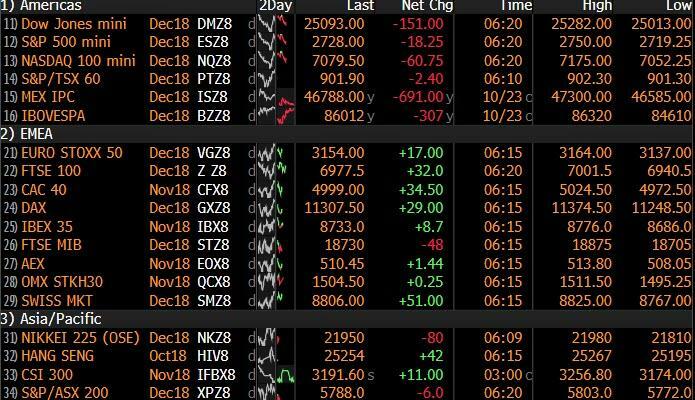 Meanwhile, European stocks bucked the Asian decline and brushed off weaker flash PMIs which underscored the growing impact of trade wars and tariffs, with most bourses in the green. European basic resources and tech names underperformed, with auto names idle despite more negative China-related news for the sector after Volkswagen slashed its outlook on Chinese sales. Italy's FTSE MIB lagged peers as the Italian banking sector sheds 1%, however with BTPs steady and the Bund/BTP spread holding around 315bp, fears over Italy remains contained. The European tech index SX8P also declined, extending Tuesday’s sell-off and trailing a broader market rebound; chip stocks tumbled further as AMS slid for a second day with downgrades rolling in while STMicro results fail to boost sentiment. Software stocks limit losses with Dassault Systemes +0.6% after raising EPS forecast. Retailers were the biggest winners in the Stoxx Europe 600, while Barclays climbed on earnings and Deutsche Bank fell after cutting its revenue outlook. The pound weakened on Brexit worries, and European bonds followed Treasuries higher. While stocks generally ignored the disappointing manufacturing data, the Euro dropped, dipping under 1.14 to the lowest level since mid-August. Trader sentiment remained fragile as global shares set for the worst month in more than three years. The cautious mood was further damped by renewed worries over the impact of tariffs after industrial bellwether Caterpillar warned about rising costs due to higher steel prices. European politics is also in focus, with Italian Prime Minister Giuseppe Conte doubling down on his government’s budget and U.K. Prime Minister Theresa May’s cabinet descending into conflict. In rates, German and U.S. curves are bull steeper, after the German 10Y breached 0.40% before the move is faded. Meanwhile, gilt yields dropped as GBPUSD breaches yesterday’s lows ahead of Prime Minister’s Questions and PM May’s appearance before the 1922 committee. US 10Y yields dropped modestly to 3.145% as the Bloomberg Dollar Spot Index stood just 0.2% short of its year-to-date high. The Canadian loonie was steady ahead of Bank of Canada’s rate decision, when it is forecast to raise rates. The Swedish krona swung between losses and gains as the Riksbank maintained expectations for a December hike. Emerging-market assets halted their declines as currencies clawed back gains after Tuesday’s slump and stocks traded little changed. The Turkish lira, South African rand and Indian rupee led the advance, while the currencies of eastern Europe traded weaker as the dollar climbed against the euro. Lower U.S. Treasury yields and a relatively stable yuan eased concern over potential outflows from the Asian region. Investors are hurting as developing-nation stocks head for their worst year since 2011, fanned by concerns the U.S.-China trade war will hurt economic expansion. Still, there’s a possibility that weaker U.S. data in the fourth quarter could trigger a tactical rally for emerging markets as the pressure from higher U.S. rates eases, according to UBS Group AG. “We’ve come up upon a tremendous wall of worry for U.S. stocks and stocks around the world,” said David Kudla, CEO of Mainstay Capital Management. "Concern among investors is the deceleration in earnings growth." In commodities, WTI resumed its sell-off touching the lowest in almost two-months on a pledge by Saudi Arabia to meet any shortfall that materializes from Iranian sanctions, with Brent dropping below its 50-DMA, flipping the Dec-Jan spread into contango for the first time since August. Expected data include mortgage applications, PMIs, and new home sales. AT&T, Boeing, UPS, Ford, Microsoft, Tesla, and Visa are among companies reporting earnings. Texas Instruments drops in pre-market trading after slashing guidance. Asian equity markets eventually traded mostly higher on what was a turbulent session, following the dramatic rebound on Wall St where all majors finished negative albeit well off worst levels. ASX 200 (-0.2%) and Nikkei 225 (+0.4%) opened higher on early bargain hunting following their recent declines and as the aggressive recovery stateside reverberated in the region. However, both indices failed to sustain their gains as commodity-related sectors dragged on Australia with energy the underperforner after a near-5% slip in oil prices, while the Japanese benchmark was temperamental and made several attempts on the 22000 level to the downside. Elsewhere, Shanghai Comp. (+0.3%) and Hang Seng (-0.4%) conformed to the volatile tone and swung between gains and losses amid indecisiveness due to on-going trade concerns and further efforts by Chinese authorities including a respectable liquidity injection by the PBoC. Finally, 10yr JGBs were marginally higher as prices benefitted from the overnight volatility and with today’s BoJ Rinban operation heavily focused on the belly. Major European indices are mostly higher, albeit off highs seen at the cash open as positive sentiment slowly fades away and US equity futures extended losses. The SMI (+0.5%) outperforms with Nestle (+1.0%) and Swiss Re (+0.8) lifting the index. The IT sector is under further pressure after yesterday's slump, amid uninspiring earnings from STMicroelectronics (-8.8%), which in turn is weighing on chip makers across the continent. On the flip side, luxury names are lifted the on back of Kering (+7.5%) after reporting a beat on earnings aided significantly by Gucci sales, with other names such as LVMH (+1.3%) and Hermes (+2.0%) move in sympathy. Furthermore, Vinci (+3.5%) are higher following a 7% beat on their revenue growth, while Deutsche Bank (-3.7%) are in the red after cutting revenue guidance. In FX, DXY - The broad Dollar and index are benefiting from the demise of most major rivals, as overall risk sentiment wobbles again after signs of a revival on Tuesday and overnight. The DXY is just off 96.341 highs, and finally breached a key level around 96.150 that has been capping rallies, with bulls now eyeing 96.402. EUR/GBP - Propping up the G10 pile, but for different reasons as the single currency breached technical support around 1.1430 vs the Usd and tripped stops below 1.1425 in wake of prelim Eurozone PMIs that fell short of expectations, and with the pan manufacturing survey particularly weak given sub-50 new orders. Meanwhile, Cable retreated further from 1.3000+ highs to trigger some chart-related offers around 1.2937 ahead of UK PM May’s 1922 showdown and ongoing Brexit uncertainty, which is keeping the Eur/Gbp cross above 0.8800. SEK - Clawing back lost ground, largely due to the aforementioned Eur weakness, having weakened to circa 10.3900 and not far from heavy supply/resistance at 10.4000 following the latest Riksbank policy meeting, as guidance was maintained for a hike either in December or February next year. This, despite recent Swedish inflation data surprising to the upside and 2 hawkish dissenters calling for a 25 bp rise in the repo. However, the consensus remains for gradual normalisation and an expansionary stance to continue for an extended period even after the 1st tightening for years is delivered. Hence, Eur/Sek back down to 10.3300, or just under, and Eur/Nok following suit (sub-9.5000). AUD/NZD - The antipodean Dollars have both slipped back from overnight peaks, as the Yuans weaken and the aforementioned Chinese-led global stock market recovery wanes. Aud/Usd is back under 0.7100 and Nzd/Usd pivoting 0.6550, with the Kiwi now looking towards NZ trade data for some independent impetus. In commodities, gold is moving sideways, off yesterday's highs as the yellow metal detaches itself from USD action to moves in lockstep with risk sentiment, as markets are focused on the Italian budget, trade tensions and concerns over US earnings. Copper prices fell slightly (-0.2%), which could be related to doubts from investors regarding China’s plans to invigorate their economy. a larger-than-expected build of 9.88mln barrels against an expected 3.70mln barrels, which provided further pressure to the complex. Traders will be keeping an eye on the weekly DoE crude inventory numbers released later today with focus on US oil production. Hopefully someone reading this is $1.6bn richer after last night’s mega US lottery draw. My builder and the global equity markets both need you. To put this mind boggling sum in some context though the Bloomberg global equity index lost $637 billion in market cap yesterday. So we’ll need a few lottery winners to fill the gap at the moment. Even with a near 2% rally from the lows of the session US equities fell last night to cap another troubled day for risk across the globe. The S&P 500 did pare losses of as much as -2.34% to close only -0.55% lower (nearly got back to flat at one stage late in the session). The moves were similar for the DOW and NASDAQ, which retraced from down -2.17% and -2.79% respectively to close down -0.50% and -0.32%. The FANGs opened down -2.92% in New York, but ultimately closed +0.45% higher. Investors were initially spooked by some cautious commentary from earnings reports (more below), but the concerns faded through the US session. Still, the S&P 500 is on track for its worst month since August 2015, and most global equities are down for the year. North America is still the best performing region with 67% of the six countries having benchmark equities trading higher on the year in US dollar terms. In EMEA, only 23% of countries are up, and only 6% of countries in the European Union (in USD). In South American (6 countries) and Asia (18), not a single country has a positive return in USD terms this year. The recent selloff has taken a steep toll. The UK’s FTSE (-1.24%) briefly touched levels yesterday that it first breached in 1999, while across the continent, indexes hit multi-year lows. The STOXX 600 fell -1.58% to its lowest level since Dec 2016. The DAX (-2.17%) and IBEX (-0.91%) also closed at their lowest levels since 2016. European banks (-1.27%) are at their lowest levels since October 2016 just ahead of an important Q3 reporting season. Its almost as if the calm and positive 2017 never happened now for many indices. Indeed the VIX and V2X both closed above 20 again - levels the former didn’t cross in 2017 and the latter only crossed around the French elections. Away from equities, other risk assets also traded lower yesterday, with the index of US HY CDS rising +8bps to hit fresh highs since 2016. The cash US HY market has held in much better but is finally starting to respond to the external environment widening 13bps yesterday and over 50bps from the recent tights. We’ve long seen it as the most expensive RV part of the credit spectrum. Safe havens rallied yesterday, with 10-year Treasury and Bund yields falling -3.0bps and -3.9bps respectively. Gold advanced +0.70% to a 3-month high, and the yen rallied +0.35% versus the dollar. This morning in Asia, markets are trading mixed with the Nikkei (-0.12%) down while the Hang Seng (+1.08%), Shanghai Comp (+1.29%) and Kospi (+0.34%) are up. However, at one point the Shanghai Comp and Hang Seng were down as much as -0.65% and -0.60%, respectively before paring back the losses. In the meantime, China continues its drip feed of stimulus for the stumbling markets with the PBOC announcing yesterday that it plans to give CNY 10bn to China Bond Insurance Co. to provide credit support for debt sales by private enterprises. Elsewhere, MSCI Asia Pacific index was down -19.97% from its January high after yesterday’s close and is flirting with bear market territory. So one to keep an eye on over the next few sessions. In other news, US President Trump ramped up his criticism of Fed Chair Powell. In an interview with the WSJ he said that Powell “almost looks like he’s happy raising interest rates” and that it is “too early to tell, but maybe” he regrets appointing him. Trump also said that he was intentionally sending a direct message to Powell that he wanted lower interest rates, even as he acknowledged that the central bank is an independent entity. Back to yesterday and earnings reports dominated market attention with a series of negative releases weighing on the market in early afternoon trading. Caterpillar, the machinery manufacturer seen as a global macro bellwether, reported strong earnings but expressed caution about the outlook. The company reported that manufacturing costs were higher due to increased material and freight costs, and cited tariffs as a headwind. 3M, another diversified industrial firm, revised down its earnings guidance, citing the strong dollar as a headwind. Those two firms traded -7.56% and -4.38% lower, respectively. In Europe, automaker Renault reported a drop in revenues, saying “the situation in emerging markets is hurting pretty bad” and the “underlying market in the UK is not good.” Chipmaker “ams” lowered its profit guidance, and IT services firm Atos cited a “more uncertain and challenging” global environment.” There were some bright spots from Lockheed Martin, McDonalds, United Technologies, and Verizon, but they didn’t fully outweigh the cautious tone. With the renewed focus on tariffs and the stronger dollar from some corporate earnings reports, markets were especially sensitive to the relevant rhetoric from US policymakers. Comments yesterday from White House economic adviser Larry Kudlow did not ease concerns, as he said that Presidents Trump and Xi will meet at next month’s G-20 summit but downplayed the likelihood of a deal that would defuse tensions. Kudlow said that “I’d love to see them [China] respond” to the administration’s requests, but “thus far, they haven’t.” The yuan briefly eclipsed its weakest closing level of the year (6.947) during yesterday’s trading, before closing within 0.06% of that level. Our economists continue to expect China to ease policy to combat trade tensions, weakening the yuan to 7.40 next year. Italian BTPs rallied as much as -7.3bps in the morning before reversing gear, and ultimately closing +10.2bps higher. Initially, sentiment improved on optimistic rhetoric from Eurogroup Chair Mario Centeno, who said that talks with Italy have been “very positive” and that he was optimistic that the European Commission would reach a compromise with the country authorities. Press reports in Il Messaggero said that the Italian government was readying a “plan B” to address the Commission’s concerns by moderating the pace of planned expenditures. Later in the session, however, Prime Minister Conte directly refuted the reports, saying there is no “plan B.” The Commission formally rejected Italy’s budget and their rhetoric was not especially constructive. Commission Vice President Dombrovskis said that “the Italian government is openly and consciously going against commitments made.” So tensions continue to escalate on this front and we expect the trend to continue. Sterling also saw steep intraday moves, gaining as much as +0.62% versus the dollar before trading lower to close only +0.17% higher. Initially, investors were encouraged by reports that the EU will offer Prime Minister May a UK-wide customs union arrangement in an effort to resolve their outstanding issues. Our economists do not think that such an arrangement will be easy to get through parliament. If it covers the entire UK and is open-ended, the hard Brexiteer flank of the Conservative party will not be satisfied; if it is temporary and separates the UK and Northern Ireland in some way, the DUP will not be satisfied; and the EU is unlikely to support a deal that resolves these differences. Later in the evening, a cabinet meeting at Downing Street reportedly (per Bloomberg) erupted in intra-party conflict as PM May tried to navigate all these differences. Separately, The Times political editor tweeted late yesterday that the Brexit transition will last for years under PM May’s latest plan where Plan A is to involve Northern Ireland in a separate VAT area. The Times further reported that the Brexit transition period will be on a "rolling" basis with an annual "decision point" where any transition extension is reviewed. The geopolitical dispute between Turkey and Saudi Arabia continued to escalate yesterday, with Turkish President Erdogan describing the disappearance of journalist Jamal Khashoggi as “a political murder.” He endorsed the “sincerity of King Salman” but pointedly stopped short of mentioning Crown Prince Mohammed bin Salman. The tensions did not drive market action, but will continue to receive outsized attention as Turkey continues to makes its influence count (Bloomberg). Separately, Brent crude oil dropped -4.32% for its worst day in over three months. Saudi Energy Minister said that OPEC is in “’produce as much as you can’ mode” and that he is confident that the cartel “will meet any demand that materializes.” Increased supply could balance out disruptions in Iran and Venezuela, which have underpinned the rally in oil prices this year. Additionally, investors anticipate the Department of Energy will tomorrow announce a fifth consecutive weekly build in US crude oil inventories, the longest such stretch since the first quarter of 2017. The data front was relatively quiet yesterday. German PPI printed at +0.5% mom and +3.2% yoy, beating expectations for +0.3% and +3.0%, though the upside was driven by higher energy costs rather than underlying pressures. In the UK, the Confederation of British Industry reported the October manufacturing new orders index at -6, missing expectations for a reading of +2 and the lowest print since 2016. Finally, in the US, the Richmond Fed manufacturing index came in at 15 versus expectations for 24, a miss but the 25th consecutive month of expansion, the longest stretch since 1995. Data releases will be in focus today, with preliminary October PMIs across the globe. France, Germany, and the euro area will report their manufacturing services, and composite PMIs in the morning followed by the US in the afternoon. We will also get France's October business confidence, manufacturing confidence, production outlook indicator, and business survey overall demand. The ECB will release September’s M3 money supply, and the British Bankers’ Association will publish its September finance loans for housing in the UK. In the US, we get latest weekly MBA mortgage applications, August’s FHFA house price index, September’s new home sales, and the Fed's latest Beige Book. Away from data, the Fed's Bostic, Bullard, and Mester will be speaking at different times. European Council President Donald Tusk and the European Commission President Jean-Claude Juncker will present conclusions from the October 18-19 summit to the EU Parliament. Besides this, Barclays, Microsoft, AT&T, Boeing, and Ford will report their earnings.